With Social Media, the knowledge is easily accessible to students – not just bookish knowledge, but also the practical knowledge that is available. In addition, it also helps them develop their network and associate with the right people. 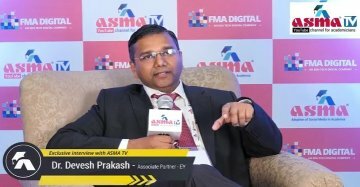 Dr Devesh Prakash (Associate Partner – EY) speaks to #ASMATV about the importance of ASMA for academia and corporate, how students can leverage the knowledge accessible via social media, role of social media in networking, education 4.0, and more.